A growing, high-tech R&D startup company specializing in helping athletes maximize performance gets a headquarters that matches its efforts in wellness, technology, and sophistication. Located in Boston’s Fenway neighborhood, WHOOP needed more space but liked the quirky, unfinished (think exposed spiral ducts and sealed concrete floors), nature of their existing office space in the old Sears art deco building built in the 1920s. The challenge was to create a similar aesthetic in the Van Ness Building, a newly completed, modern office building. They wanted the workplace to speak to the athletic nature of their business; provide ample, flexible, and transparent hi-tech workspace; and offer a variety of formal and informal meeting/collaborative spaces for staff and client entertaining. Equally important – the office needed to accommodate facilities to assemble and test the product in development. The result is an office that seamlessly incorporates a hi-tech workplace, gym, and light manufacturing facility. With a clean, modern, minimal aesthetic the workplace projects the youthful energy, physical involvement, and entrepreneurial spirit of the company, while a direct view of baseball’s legendary Fenway Park provides daily inspiration. WHOOP is a growing, high-tech R&D startup company known for developing the WHOOP Strap 2.0 which uses sophisticated, ground-breaking biotechnology to help athletes maximize performance. The reception desk at WHOOP showcases the company’s modern, clean, youthful personality, which includes the innovative design of its logo. New. Build out of raw, unfinished space. When first entering WHOOP headquarters, the visitor might not immediately know whether this is an office or a gym. Predominately open plan with sit-to-stand open-plan workstations. There are four enclosed offices for executives. The WHOOP office expresses the function and face of the brand: beside a chic lounging area is an exercise room with an array of state-of-the-art workout equipment. There are a variety of different sized enclosed meeting rooms (1-18 Seat Board Room, 1-10 Seat Conference Room, 1-6 Seat Conference Room, 3-4 Seat Conference Rooms, and the Brand Lab with causal seating for four). Open, breakout meeting spaces include lounge seating, a harvest table, and café seating. Large Café space, lounge, exercise room, and roof deck. Exercise equipment is an integral part of WHOOP headquarters, set immediately adjacent to the company brand room and client seating area. WHOOP’s CEO, CFO, and several other senior team members took active, leadership roles in the planning and design process for WHOOP’s new workplace. From developing the space program to asking staff for input, to vendor visits to selecting furnishings, the executive teams along with their employees were fully engaged. There were programming sessions with WHOOP’s team, their project advisor, and the Building Landlord—Samuels & Associates— to establish the new workplace program. WHOOP’s leadership team informally canvassed their employees to learn about the staff’s concerns regarding the new workplace. Priorities that emerged included the youthful, active staff’s request for access to a gym, and for a high percentage of the team’s workstations to be sit-to-stand desks. Transparency was the single most important design element required by the company founder, therefore when first entering the new WHOOP headquarters visitors experience the space as both an office and a gym. Immediately visible are a gracious, daylight-filled reception area, a living room/showroom area, a bank of exercise machines, a glass-walled conference room, and outside the window – Fenway Park. Keeping an open feel was also important to WHOOP’s team; at the same time, they also required a certain amount of privacy in the enclosed offices. Since they wanted a raw, industrial-like space (no ceilings in the majority of the spaces, polished concrete floors and very few soft goods) controlling sound became one of the design challenges. With WHOOP’s business dedicated to tracking and maximizing athletic performance, they also encourage fitness and wellbeing on their staff’s behalf. This encouragement includes 24/7 access to a local gym, exercise machines in the office, an expansive (950-square-foot) café for relaxing, recharging, and socializing and a roof deck. With floor-to-ceiling windows along one entire wall, the boardroom takes full advantage of the view of Fenway Park, as well as benefiting from daylight throughout the workday. To help control sound, 1 ½” thick Tectum panels were installed on the ceilings of private offices and meeting rooms where acoustical ceilings were not desired. In addition, areas of carpet where installed to help control reverberation within the office space. 1 ½” thick Tectum panels were installed on the ceilings of private offices and meeting rooms where acoustical ceilings were not desired. The furniture made a large impact on the space. Approximately 1/3 of all of the open workstations feature a sit-to-stand work-surface option. The workstations were provided by Knoll. Transparency is a driving principle behind the design at WHOOP. Workstations are set in open collaborative groups, and walls around the few private offices are glass. Employees all work at sit-to-stand desks that support health and wellness for everyone. The design of privacy film for the glass office front incorporating the use of WHOOP’s brand “W” was used throughout the space. A backlit sign of the “WHOOP” corporate logo was installed on the back wall of the reception desk. WHOOP’s branded color, a bright red, was used as an accent color in the rubber flooring in the exercise room, the carpet in the board room and laminate used on custom-designed display cases in the Brand Lab, where WHOOP’s technology is showcased. WHOOP is in the business of tracking and maximizing the fitness level of serious athletes and the leadership team reflects this in their choice of office location—a stone’s throw from Fenway Park, the home of Major League Baseball’s Boston Red Sox. The open plan of WHOOP’s new corporate space makes the most of this proximity, offering stunning, inspirational views of this iconic ball field. The café provides a comfortable space for regenerating; there is a gym with exercise machines in the office as well as a roof deck for socializing. All employees are treated to the Fenway Park view as they assemble, test, and refine the WHOOP band. A blue-tooth sound system was used in the café. All of the meeting rooms are equipped with AV screens and are linked to Apple TV. WiFi is incorporated throughout the space allowing employees to work remotely, away from their workstations. When WHOOP relocated to their new space in Boston’s Fenway District, the leadership team and staff welcomed the move. WHOOP’s start-up office space had been at the top of Boston’s Landmark Center, an early 20th-century art deco building turned commercial center. While in some ways this quirky narrow halls and small rooms shouted tech start-up, the workspace didn’t support collaboration in its divided and siloed spaces. With WHOOP’s early success—growing quickly to a staff of 50 —it was clear the team needed more space. 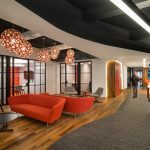 The leadership team welcomed the opportunity to design a headquarters that reflected its fitness mission, supported its staff, and was aligned with its commitment to corporate transparency. WHOOP provides a large café to its employees for relaxation, recharging, and socializing. Among the offerings are snack drawers, craft beer on tap, and a washer/dryer for post-workout laundry. Used for all company meetings, the café also features access to a landscaped outdoor terrace. WHOOP’s hoped for—and achieved!— results included a workplace that creates, supports and inspires firm-wide transparency, collaboration, and fitness within a design aesthetic that bridges WHOOP’s start-up origins with its growing success. The transparency valued by the company’s founder is expressed with open views of offices, exercise areas, meeting rooms, and Fenway Park.